The 16th edition of the European Week of Regions and Cities (EWRC), organised by the European Committee of the Regions and DG Regio, was held under the slogan “'For a strong EU Cohesion Policy beyond 2020'” in Brussels from 8th to 11th October 2018. The programme was mostly structured around three thematic priorities: 1. Territorial development (regional, urban, rural); 2. Future of cohesion policy, EU budget; 3. Education, culture and youth. The Provincial Delegation attended the official opening ceremony of the European Week of Regions and Cities on 8th October 2018, where among the speakers were Jean-Claude Juncker, President of the European Commission, Corina Crețu, European Commissioner for Regional and Urban Policy, and Karl Heinz Lambertz, President of the Committee of the Regions. The Agreement on Understanding was signed by Boško Vučurević, President of the Chamber of Commerce and Industry of Vojvodina, and President of Philippe Suinen, Walloon Union of Companies, at the premises of the Mission of the Republic of Serbia to the EU on 8th October 2018. Marking Vojvodina Day in Brussels, the “Vojvodina Great for Business, Great for Life” Reception was held at the Mission of the Republic of Serbia to the European Union on 8th October 2018, when the capacities of Vojvodina were presented to the representatives of European institutions of different fields of competences, diplomatic corps, other regions and cities, partners of AP Vojvodina, businessmen and representatives of economic organizations from Belgium, Italy, Poland, Austria and other countries. 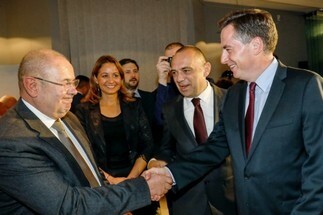 The event was jointly organised by the Provincial Government, Assembly of the Autonomous Province of Vojvodina, European Affairs Fund of AP Vojvodina – Vojvodina European Office in Brussels and Vojvodina Development Agency, in cooperation with the Ministry of Foreign Affairs of the Republic of Serbia. 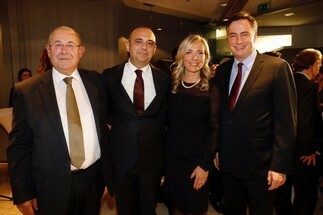 The hosts of the event were Ana Hrustanović, Ambassador of the Republic of Serbia to the European Union, István Pásztor, President of the AP Vojvodina Assembly, Đorđe Milićević, Vice-president of the Provincial Government, and Ognjen Bjelić, Provincial Secretary for Regional Development, Interregional Cooperation and Local Self-Government. In the introductory part of the programme, the guests were addressed by the hosts, after which a promotional film about AP Vojvodina, its potentials, providing the most important information on economic development, tourism, culture, technological and scientific achievements in the province in an interactive manner was shown. The programme also involved the performance by the "Lazar Novkov & Frame Orchestra" band. Among the more prominent participants were David McAllister, EP Rapporteur for the Republic of Serbia and Chairman of Committee on Foreign Affairs (AFET), Franz Schausberger, Chair of the Institute of the Regions of Europe (IRE) and Member of the Committee of the Regions, Andor Deli, MEP, Emir Đikić, CEFTA Secretariat Director, and Philippe Suinen, Walloon Union of Companies. Within the EWRC 2018, AP Vojvodina was, through the European Affairs Fund of AP Vojvodina – Vojvodina European Office in Brussels, a part of the regional partnership “Europe of Opportunities” with the following regions: Veneto, Marche, Friuli Venezia Giulia, Lazio and Lombardi (Italy), Norland (Norway), Pomeranian and Kiawsko-Pomorskie Voivodeships (Poland), the Union of Municipalities of Attica (Greece), and participated at the workshop “Addressing the challenges of the 21st century through innovative measures” held at Building Arts 56 in Brussels on 9th October 2018. In the first part of the workshop, the participants were addressed by Fabio Urbinati (Councillor, Regional Council, Marche Region, Italy), Roberto Ciambetti (President, Regional Council of Veneto, Italy), Peter Kaiser (Governor of Carinthia, Austria), Raffaele Cattaneo (Minister for Environment and Climate Change of Lombardy Region, Italy), Roberti Pierpaolo (Regional Minister, Autonomous Regional Government of Friuli Venezia Giulia, Italy), Roberto Viola (European Commission, Director General, DG Connect) and Christos Pappous (Mayor, Municipality of Fyli and Ano Liosia, Greece). The welcome speeches were followed by a panel discussion about the challenges of the 21st century that Europe was facing, as well as the answers through innovative measures. Carlo Polidori presented the Synergic Circular Economy across European Regions - SCREEN project. The project began in November 2016 and there were 17 European regions participating in it. Polidori pointed out that the project was an example of how circular economy supported the cohesion policy. After that, Prof. Susanne Elsen, Free University of Bolzano, presented social agriculture. It is a principle in which social needs are put into the context of agriculture, i.e. allowing the target group access to health and social services through agriculture, with an emphasis on mountainous areas and the Alps. Marek Swinarski, Gdansk Water Utilities Ltd, presented the innovations in water and wastewater management using the principle of circular economy. The innovations in Poland, with examples of application of biotechnology, were presented by Michal Korolko, Agency of the Regional Development in Torun Regional Association Ekip, Kujawsko Pomorskie Region. Terje Stabaek, Nordland County, Norway, gave an example of how circular economy was applied in industrial clusters in Norway, as a non EU member state. The greatest interest of the audience was attracted by the presentation of the BioSense Institute held by Prof. Vesna Crnojević-Bengin. A unique multidisciplinary mix of agricultural production and IT technology is what makes Biosens unique in Europe, and the field where Vojvodina is a leader in European frameworks. The workshop "Regions and Cities for Youth"
The workshop "Regions and Cities for Youth" was held at the Mission of the Republic of Serbia in the EU on 10th October 2018 as a Side Event within the framework of the European Week of Regions and Cities. The participants were welcomed by Jadranka Vukovic-Johnsson, European Commission DG EAC, who presented the funding opportunities for youth projects under the Erasmus+ programme. It was followed by the presentations of projects that solved the challenges young people in southern Sweden, Oslo, Veneto and Maribor faced. The main goal common to all the projects is to find the best way possible to improve the position of young people. Europe is facing a demographic change, and young people, whether being in a small village or a large city, are most affected. The discussion allowed the participants to exchange views on that important and long-term topic. In the end, Valentina Antić, Coordinator for International Cooperation, presented "OPENS 2019", Novi Sad - European Youth Capital 2019. The guests were able to learn about some of the challenges that the youth of Novi Sad had and about what was expecting them in 2019 when Novi Sad received the flattering title. Vidosava Enderić, Director of the European Affairs Fund of AP Vojvodina, was a panellist at the workshop "Cohesion for Enlargement: thriving in a stronger Union” organized by the Assembly of European Regions within the framework of the European Week of Regions and Cities in Brussels on 11th October 2018. Other speakers at the panel were Jean-Pierre Halkin, Head of Unit, Macro-regions, Transnational/Interregional Cooperation, IPA, Enlargement, European Commission Directorate-General for Regional and Urban Policy, Franco Iacop, Member of the European Committee of the Regions, Regional Councillor and President of the Friuli Venezia Giulia Regional Council, and Ana Magyar, Vice-President of the Assembly of European Regions and Member of the European Committee of the Regions. In the context of evolving debates and negotiations on the new EU budget and future cohesion policy after 2020, along with the renewed EU commitment to support the European paths of the Western Balkans, the role of the cohesion policy in strengthening the enlargement process in the region was discussed at the workshop. The speakers agreed that the cohesion policy helped bring the Western Balkans closer to the EU, in particular Serbia, which was the leader in the accession of the Western Balkans to the EU with an indicative date of accession in 2025. As Vidosava Enderić underlined the EU actively supported the Western Balkans with the Instrument for Pre-accession Assistance. Because of its favourable geographical position, Vojvodina had access to four cross-border cooperation programmes (with B&H, Croatia, Hungary and Romania), two transnational cooperation programmes (Danube and Adriatic-Ionian), as well as other EU programmes (Erasmus+, Horizon, Cosme and others). The available instruments were used to maximum in the AP Vojvodina, while the European Affairs Fund of AP Vojvodina continued to actively support the capacity building of institutions in Vojvodina to use the available programmes. Enderić concluded that through the pre-accession assistance and its alignment with the objectives of the cohesion policy, the EU supported Serbia and facilitated its gradual transition from being a candidate country to its full EU membership.